This map illustrates damage structures in the area of Sasa, east of Baba town, in Ba Province in the north part of Viti Levu Island, Fiji, as determined by satellite imagery analysis. 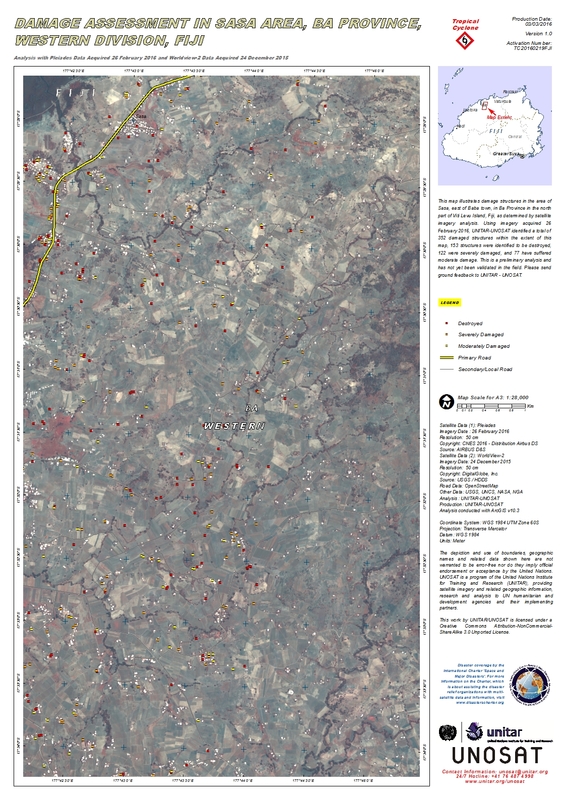 Using imagery acquired 26 February 2016, UNITAR-UNOSAT identified a total of 352 damaged structures within the extent of this map, 153 structures were identified to be destroyed, 122 were severely damaged, and 77 have suffered moderate damage. This is a preliminary analysis and has not yet been validated in the field. Please send ground feedback to UNITAR - UNOSAT.